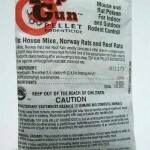 PRODUCT DESCRIPTION: Bromethalin Pellet Packs are a pelletized bait which rodents love. It is packaged in a 1/2 oz. bag that allows the rodent to smell it and easily chew it open. The active ingredient will kill a mouse or rat with a single feed. You must be careful of placement to keep it away from children and pets. Any time you use a poison, there is a risk of the animal dying some where and causing an odor problem. This product, like the bait block, will provide a quick kill and not promote bait shyness. 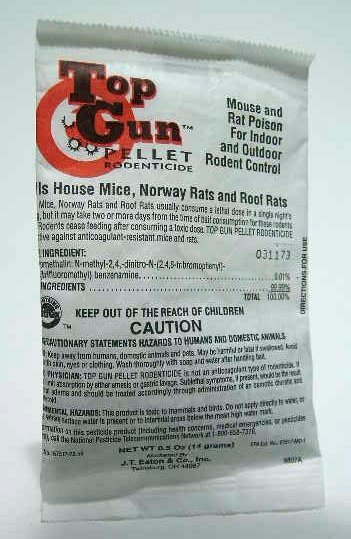 TARGET PESTS: Rats and Mice. WHERE TO USE IT: In and around businesses and homes away from pets and children. RATE OF APPLICATION: Depends on infestation. Be sure to have enough. Generally a pack is enough for every bait station or every five feet. These packs used to be sold like 1.25 per pack. Being sold by pail, are 1/2 pails not available? The labeling on all bait packs changed several years ago barring the sale of "broken" case amounts. So for items like this, the minimum quantity that can be sold is the full pail.